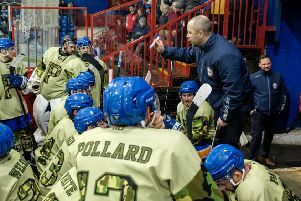 Coach Slava Koulikov described reaching the English Premier League Cup final again as a ‘huge achievement’ for Peterborough Phantoms. The city team beat table-toppers Telford in a sudden-death penalty shoot-out last night to seal their passage into the showpiece for the second successive season. Janis Auzins was a star for Phantoms in their cup success in Telford. And Phantoms will now battle with biggest rivals Milton Keynes to lift the trophy as they bid to avenge a final defeat at the hands of Guildford last term. “I’m really happy for the guys,” said Koulikov. “Around two months ago, we were sat in eighth position in the cup standings and I told them I believed we could make it into the top four. “They have showed great desire to fight through to the semi-finals from that original meeting, and it is a huge achievement to now be in the final. “We produced a great performance in the first leg, but knew we would find it very hard to win in Telford. I’ve not seen them play that well since they did the double two seasons ago. “But we had the lifeline of knowing we would get to overtime at the very least and once it was clear we weren’t going to win in regulation time, we had to start planning for that. “My nine Brits were amazing in those five minutes of three-on-three. We matched Telford with their imports, and then we managed to win in the shoot-out. “The final couldn’t really be any bigger, could it? It’s against our rivals and the best team in the league in my opinion. “It will be extremely tough for us, but hopefully we can come up with a gameplan to give ourselves a chance. “Last year we went into the final believing we had a good opportunity to win the trophy, but everything went wrong in the first leg and a 50/50 chance became virtually no chance. The final is likely to take place during February. Telford coach Tom Watkins did not take his side’s semi-final elimination well. He branded the competition rules as ‘ridiculous’. Watkins, speaking to the Shropshire club’s website, said: “The best team over two legs has gone out of the competition. I don’t know in what other country they would play this system.